Jews first settled in Helena in the early 1840s. From their earliest arrival, Helena Jews sought to maintain their religion. In 1846, the small number of Jews in Helena was able to borrow a Torah from Congregation B’nai Israel in Cincinnati to use for the high holidays of Rosh Hashanah and Yom Kippur. Although Jews were worshipping together in Helena as early as the 1840s, they did not organize an official congregation until 1867, when sixty-five Jews banded together to form Congregation Beth El (House of God). In 1875, they purchased land for a Jewish cemetery. Beth El was among the earliest members of the Reform Union of American Hebrew Congregations, joining in 1875. Initially, the fledgling congregation worshipped in the homes of its members. Later, they met in a rented storeroom on Ohio Street, and then a former church. At the wedding of Charlie Meyers and Celia Weinlaub in January of 1880, members of the congregation finally decided to build a synagogue. By October of 1880, the brick building at the corner of Perry and Pecan Streets was completed. At the dedication ceremony, Rabbi Max Samfield from Memphis’s Temple Israel was the featured guest. Rabbi Samfield’s presence reflected the strong connection between small communities like Helena and larger cities like Memphis. It also initiated a long and meaningful relationship with Temple Israel and its rabbis, which continued into the 1980s when Memphis’s retired Rabbi James Wax traveled to Helena once a month to lead services. In its early days, Beth El did not have a rabbi of its own. Their first rabbi, Abraham Meyers, did not arrive until 1879. In fact, Dr. Garrison, a local Methodist minister, sometimes conducted funerals or weddings of congregants when no rabbi was available. This unusual arrangement reflected the strong interfaith relations that existed in Helena since Beth El’s beginning. Before they had a building of their own, Beth El rented a former Presbyterian Church, which they shared with a local Methodist congregation that was building a new church at the time. In 1896, Beth El’s board voted to allow St. John’s Episcopal Church to use the synagogue while they were constructing a building of their own. A few years later, the choir of St. John’s Church sang during Beth El’s Sabbath service. The temple later allowed a local Methodist Church to use the building for services Sunday morning and evening and Wednesday evenings. This strong sense of interfaith fellowship reflected the acceptance that Jews enjoyed in Helena. Dr. Garrison’s service also shows the difficulty Beth El often had finding and keeping rabbis. In the late-nineteenth century, there were not enough rabbis to go around in America, and they often left their congregations in search of bigger cities and salaries. For a small, rural community like Helena, keeping quality rabbis was a serious challenge. In 1898, the congregation invited the rabbi from Vicksburg to give a guest lecture, and secured a rabbinical student from Hebrew Union College to lead services during Rosh Hashanah and Yom Kippur. In the summer of 1900, they hired Rabbi Abram Brill, a recent graduate of Hebrew Union College to be their full-time rabbi for $1,500 a year. Rabbi Brill was quite popular, and he was unanimously reelected by the congregation in 1901. 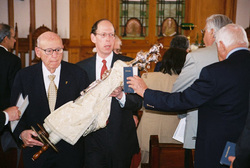 The following year, Rabbi Brill was offered the pulpit at the much larger congregation in Greenville, Mississippi, which he accepted. Before he left though, he secured a new HUC graduate to replace him. This was no small task: the graduating class at HUC in those days was usually ten men. This limited supply of Reform rabbis made it very hard for a small congregation like Beth El to find someone to occupy its pulpit for a long period of time. Over the next several years, the pulpit at Beth El was a virtual revolving door, as the congregation struggled to keep it occupied. Most of their rabbis were recent seminary graduates, who used Helena as a stepping stone to larger congregations, often in the North. Between 1879 and 1960, Beth El had twenty-one different rabbis. Perhaps because of the revolving door nature of the position, the members of Beth El reserved great power over religious ritual and services. When Rabbi Aaron Weinstein arrived in 1909, just after graduating from Hebrew Union College, he was informed by the temple’s Ritual Committee that his sermons could not exceed fifteen minutes. Apparently, he followed these orders rather well, as he became a very popular rabbi. In 1912, they gave him a contract extension and a raise. A few months later though, he resigned to take another pulpit. When his replacement, Rabbi Samuel Peiper requested that the congregation rise together for the Kaddish, the prayer for mourning the dead, they refused to change their ritual practice. At Beth El, the laity was in charge. 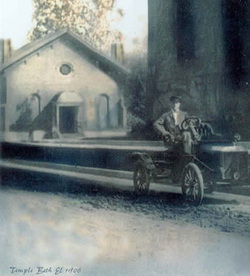 In 1916, the congregation completed work on its second and final building, which featured a $4,000 organ paid for by the congregation’s Ladies Benevolent Association. The association had long played an important role in supporting Temple Beth El. In 1904, they paid to add indoor toilets to the synagogue. The next year, when the temple needed a new roof, the Ladies’ Benevolent Association paid for it themselves. When Beth El moved to their new synagogue in 1916, a significant portion of the cost was borne by the Ladies Association. 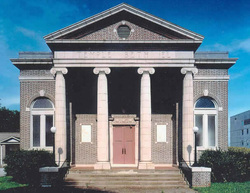 In addition to serving Jews in Helena, Beth El was a regional congregation that attracted Jews from such smaller towns as Marianna, Marvell, Holly Grove, Trenton, and West Helena. In 1904, Jews in Marianna asked whether Beth El’s rabbi could lead services there once a month; the temple board agreed as long as they became dues-paying members of Beth El, which they did. This regional nature of the congregation is apparent in the window memorials in the main sanctuary. One was donated by the Jewish citizens of Marianna, one by those in Marvell, and another by a member who lived in Marks, Mississippi. Over the years, as Helena and the rest of the Arkansas Delta began to decline economically, Beth El’s membership shrank as well. In 1967, at Beth El’s 100th anniversary celebration, the congregation had sixty-eight families, with 109 members, not including children. Since then, its decline has continued, until today, when there are fewer than twenty members remaining in the area. In 2006, they came to the difficult decision to bring 139 years of congregational history to a close. They donated their temple to the state for use as a community arts center. Many of the artifacts from their historic building went to the recently formed Congregation Etz Chaim in Bentonville, Arkansas. Their pulpit furnishings went to Temple Israel in Memphis for use at their cemetery chapel.